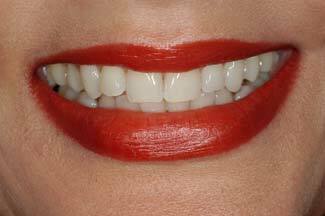 Tooth Whitening is the No.1 requested and performed cosmetic dental procedure in the UK. In everyday life the microscopic pores of your teeth are pigmented with substances such as red wine, coffee and tobacco. These, in conjunction with age related changes give can your smile a stained and discoloured appearance. Tooth Whitening lightens teeth and helps to remove stains and discoloration. It is effective in 95% of patients. Tooth Whitening is the ideal procedure to have just before that important social occasion allowing you to have a radiant smile in all of your photos. A variety of options are available today for you to brighten your smile, but dentist-supervised treatments remain the safest and most effective way to a brighter whiter smile. Your dentist will conduct an initial consultation and a thorough assessment. The options appropriate to your case will then be thoroughly discussed with you to provide a customised Tooth Whitening procedure. Tooth Whitening is a simple technique using hydrogen peroxide to lighten the shade of your teeth. This is Smile Cliniq’s most popular procedure to dramatically improve your appearance, at significantly less cost and inconvenience than other techniques. Tooth Whitening is most effective on surface stains caused by age, or pigmented foods and drinks. The whitening of your tooth occurs due to breakdown of the peroxide gel providing highly active oxygen free radicals. These effectively break up the unattractive pigmented molecules causing the stain to be removed, providing you with a brighter whiter smile. The lighter the stain the easier it is to whiten. The most severe discolouration (e.g. 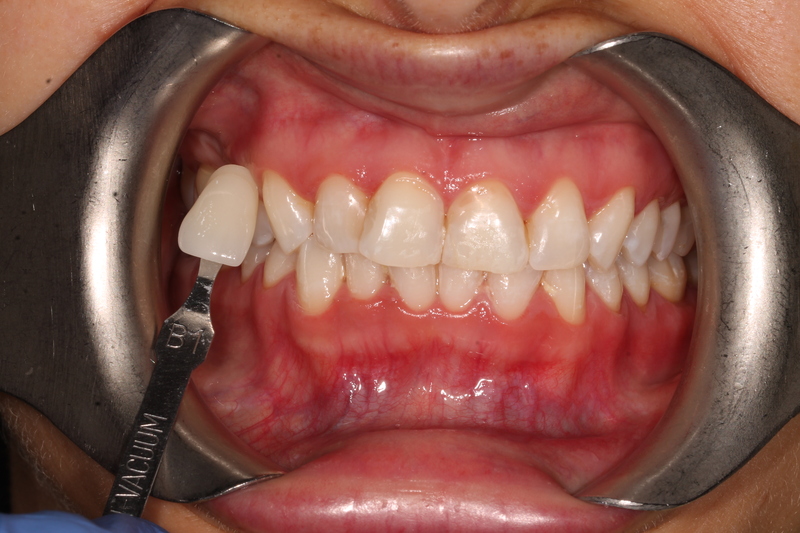 tetracycline staining) may require a longer period of active Tooth Whitening with subsequent veneers. Over the counter systems are not on a par with Smile Cliniq approved products. They differ in the type of chemical used and its active concentration. Scientific literature and research indicates dentist-monitored Tooth Whitening is the most effective and safest way to lighten discoloured teeth. 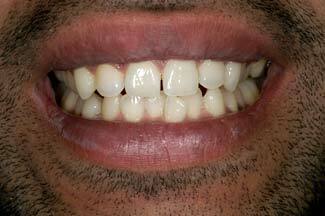 You may have existing tooth coloured restorations such as crowns or white fillings, these will not alter in shade. This is your choice. Generally the longer you bleach your teeth the whiter they become. In today’s cosmetic conscious society, shades accepted in the past have been superseded by the pearlescent whites that people now accept as normal. 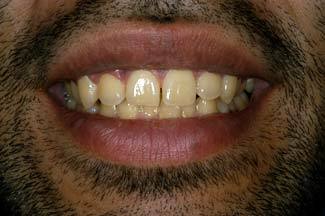 The general dental consensus is the shade of the teeth should match the whiteness of a person’s eye. These generally contain too little of any active Tooth Whitening material to provide a true whitening result. Instead the product is likely to contain an abrasive material, which physically removes layers of your tooth. This gives an apparent whiter tooth but with a dull appearance. A preoperative shade of your teeth is taken prior to commencing any Tooth Whitening procedure. Once your treatment is complete, a post-operative shade is taken. Depending on location, we maybe able to offer professional photography to show you at your best. On your initial visit to the London Smile Cliniq dental practice, your dentist will take an impression (mould) of you teeth. From this, a customised tray is made to snugly fit to your teeth. These trays ensure that there is minimal leakage and maximum cosmetic effect. Once constructed the trays will be checked for accuracy of fit and specific instructions will be provided on your tooth-whitening regime. Customised trays are loaded with the easily applicable peroxide gel and worn for between 2 and 4 hours for several days. A brief visit after active treatment to your dentist ensures that a Tooth Whitening effect has occurred and that you are pleased with your result. 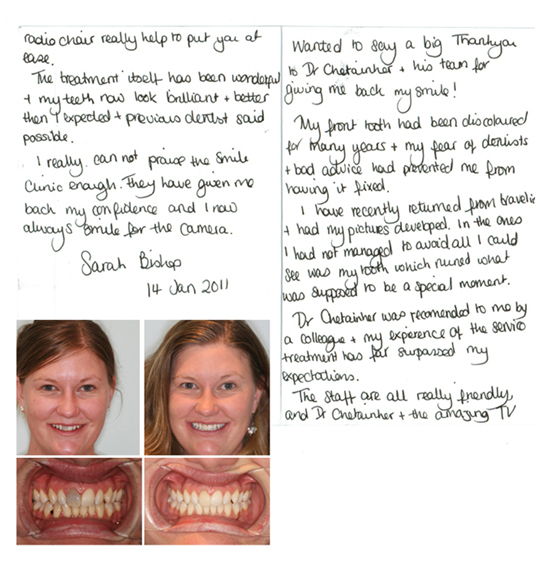 In house Tooth Whitening is carried out by one of our dentists at the Smile Cliniq dental practice. This system is perfect for those who want an instant result. State of the art equipment is used to whiten and brighten your smile by up to 8 shades in only 60 minutes. Your teeth maybe professionally polished to ensure optimal efficacy of the Tooth Whitening procedure. Your dentist protects your gums and surrounding tissues with a barrier membrane. The active tooth-whitening agent is then applied to your teeth. A light shined onto the Tooth Whitening gel to allow maximum activity of the carbamide peroxide. 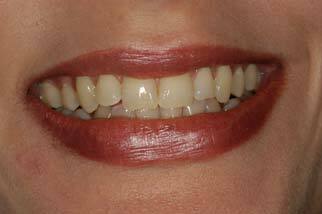 The Tooth Whitening gel is replaced several times during the procedure to give optimal results. Once the treatment period is completed your dentist will show you how many shades your teeth have changed. Occasionally a combination of the two above treatment types maybe used to ensure optimal resultsand whiter teeth. What are the common side effects fo Teeth Whitening? 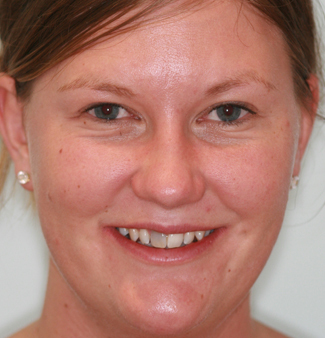 The majority of Smile Cliniq’s patients undergo Tooth Whitening without any adverse effect. A small number of patients may experience mild sensitivity and/or irritation of the gums. There are several ways in which this can be resolved, in the vast majority symptoms settle within the first few days. Cigarette smoking, tea, coffee, red wine and other pigmented substances are best avoided in the initial post-operative period. If these specific instructions are not followed you may see the whiteness start to fade in as little as one month. After a period of time, due to the nature of today’s lifestyles you may notice that the whiteness of your smile may have faded. 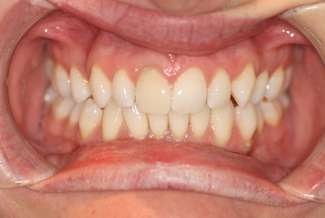 Many people undergo a yearly “top up” procedure to maintain their bright white smile. You must discuss your whitening schedule with your dentist and, talk about products that would work best for you. It is important to employ a strict oral hygiene regime encompassing professional hygiene intervention. You will be shown the most appropriate method to ensure optimal oral health. Regular recall and review is essential to ensure an optimal status of your smile. I injured my front tooth when I was about 10 years old in primary school. I ran into one of my taller, much bigger classmates!! I was taken to the dentist almost immediately after it happened as my lip was massively swollen, however there was too much swelling to see the full extent of the damage, but the dentist suspected I had killed the nerve and would need a root canal. A few weeks later I had the root canal done. My front tooth began discolouring a few days after the accident and continued to get darker until it became a very noticeable dark grey colour. At the time it didn’t really bother me as I was so young. It was only in later years, when I was about 15 years old that it really started to bother me, especially when I got my braces off which made the darkened tooth even more noticeable, as up to this it was partially covered by the brace itself. I had had internal bleaching done on the tooth when I was about 13 years old and on holiday in New York, as my mum’s friend is a dentist there. 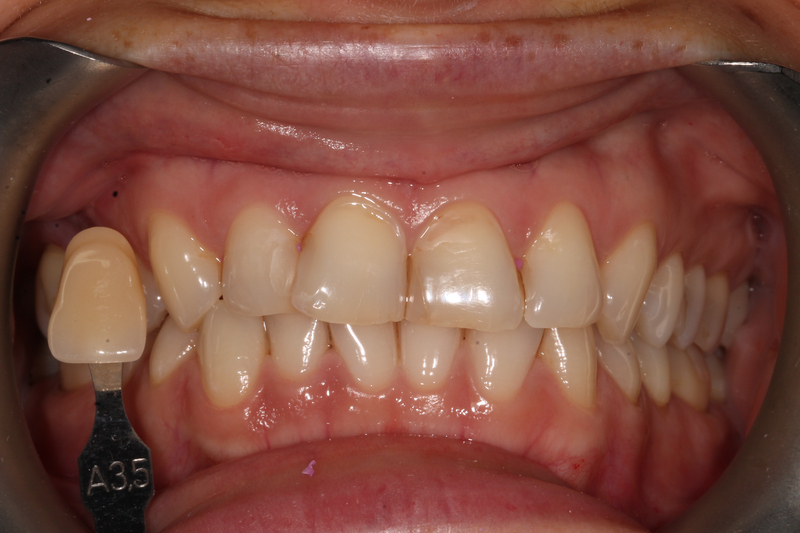 The results were good but as I was only able to make it to 2 out of the 3 recommended sessions, the tooth began to discolour again within a few years. When I was around 17 years old I had more treatment, this time a whitening kit that I used at home for 2 weeks. The results of this were good but not perfect and again this only lasted a few years. In recent years, the discolouration of my front tooth has really bothered and is something I particularly noticed in photographs. It was the first thing my eye was drawn to anytime I saw a photograph of myself. Thanks to years of Orthodontics I finally have nice straight teeth that I’m delighted with and take very good care of, however all of this I felt was over shadowed by my grey front tooth. 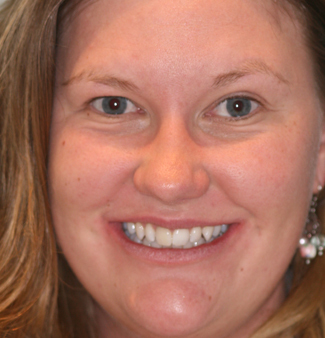 It made me very self-conscious and paranoid about my smile, despite the fact that the rest of my teeth were healthy. 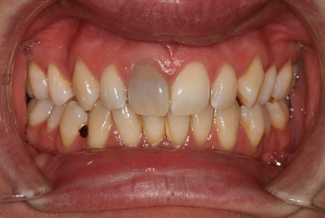 The results from the internal bleaching treatment carried out by Dr.Chetan and his colleagues have been amazing. There has been a massive improvement in the colour of my front tooth and I no longer notice it in pictures. I’m delighted with the results and definitely would recommend this procedure to anyone with the same problem as mine, who like me do not want to go down the road of a crown or veneer. Many thanks to Dr.Chetan and his colleagues! !